In December 2015 Burge Bird Rescue opened The Sanctuary Room. Over 1,000 square feet is devoted to providing shelter for about 50 retired breeding birds or special needs birds that are difficult to place in adoptive homes. Some of these birds are old wild-caught parrots that have never been tame, others are blind or have ongoing medical needs that require frequent treatment. Three outdoor flight cages will allow the parrots to enjoy fresh air and sunshine as weather permits. To see photos and details of the room click HERE. Below are the residents of The Sanctuary Room. Would you like to sponsor one of these feathered friends? The sponsor donates $25 or more toward the care of the birds, and their name will be listed on this page and on the bird's cage card for one year. Email us at BurgeBirdRescue@yahoo.com if you would like to become a sponsor. Meet Pepper and Emily, the Red Throated Conures. We see only a couple of these in our veterinary practice in recent years since they were never a widely owned species. Emily was born in 1996, and Pepper, born in 2002, was the son of Emily and her late husband RT. He lived with a human family for two years and then was returned to us, and eventually moved in with his Mom to keep her company. This is Bertha, who was an adult when she came to us in 1992. She is a Green Conure. Parrots of this species typically have a few red freckles on the neck, but are otherwise green all over. Because they don't have exciting colors, they were never a popular species in breeding programs, and they are now rarely seen in captivity. Bertha was married to two different males, but never had babies or even eggs. Both of her husbands have passed away, and she is currently living alone. This is Van Gogh, the Jenday Conure, who was born in 1995. He lost his mate Cosmo this year and now lives alone, but with plenty of friends and neighbors to talk to. Jendays are a close cousin to the Sun Conure, which is coveted for the brilliant yellow and orange that covers most of the body. The Jendays have more green on the wings and back, but as babies the two species look almost identical. They are not known as great talkers, and like the Suns they can be pretty loud for their size. Few people have ever seen a bird like Gizmo, who was labeled as an "adult Green Conure" at a bird fair in 1998. She is an Austral Conure, and is the only one of her kind we have ever known. Since she never had a mate, she chose to live with Cherie, a Dusky Conure born in 1988, after his wife passed away. They are a sweet elderly couple who enjoy snuggling together. Dusky Conures are known as one of the sweetest, gentlest members of the conure family. They are green with a grey head and some blue on the wings and tail. They are not great talkers. Austral Conures are found at the southern tip of South America, farther south than any other parrot species. Our oldest known conure is White Eyed Conure Jughead, who was born in 1988 and came to us in 1993. He lived with another veterinarian who wanted to place his bird in a home where he would be guaranteed good care for the rest of his life and would have the companionship of his own kind. Jughead and his late wife, Wild Thing, had several babies in the 1990's, when handfed chicks were in great demand before the parrot population started to exceed the number of good homes available. According to Wikipedia, the lifespan of a White Eyed Conure is 28 years, and Jughead will turn 30 this year. He does have some feather loss on his lower torso and the left side of his face, but he otherwise seems to be in excellent health. Dusky Conures Limey and Kiwi seemed destined to be together since they were both named after green fruits. He was born in 1997, while she is the "older woman" born in 1996. They had a number of babies in the late 1990's, but unlike a lot of bonded pairs they are both still relatively gentle and calm around people. A couple of articles in Bird Talk Magazine in the 90's touted Dusky Conures as the sweetest, gentlest, most underrated members of their family. Prior to this they were not favored by many breeders or pet owners because they are not very colorful. You almost need sun glasses when you look at Loco and Morgan. They are Sun Conures, one of the brightest and most colorful parrots you can imagine. Many people decide to get one because of their beauty, and then discover how incredibly loud they can be for their size. Suns aren't known to be good talkers, but they can still be sweet, loving pets. Both of them were born some time in the mid-90's. Although they have been together since 2001, they never had any eggs or chicks. Many childless couples are very happy with their circumstances, and are fulfilled by their careers and even volunteer work. Loco and Morgan seem happy to just be together. Whisper and Baby, the Green Cheek Conure pair, were together since 1994. They had babies for several years before their nestbox was removed, because Green Cheeks are known to be prolific breeders and won't stop nesting and raising chicks unless they have no nest. Baby passed away this year at the age of 24, and Whisper, born in 1992, has been retired to a smaller cage in a warmer room for our elderly and disabled birds. 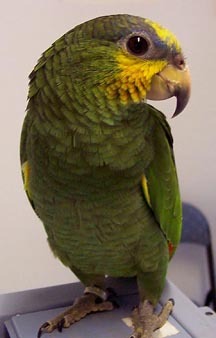 Green Cheeks are the most common species of conure we see as pets. There are a variety of Green Cheek color mutations available, and they are frequently seen for sale in pet stores. They are real type A personalities who like to boss their family members around. They are also the species most frequently injured when they try to attack larger birds because they believe they are huge. Nanday Conures had a bad reputation among some parrot people. A judge at one bird show years ago went on a rant about how loud, ugly, worthless and disease-ridden Nandays were. Then he had the nerve to write the same thing about them in an article in a magazine. We got our revenge a couple of years later by taking eight Nandays to a show where he was judging so he had to listen to them squawk all day. Ziggy, who was born sometime in the 1980's, was a handsome bird in his day, but he plucked out most of his chest feathers after his first wife passed away. He got himself a pretty, young, second wife, Yoyo, who was hatched in 2001. Funny how young women will marry balding old men, thinking they are going to inherit a lot of money. The joke is on her, Ziggy is broke! It never happened on the TV show, but in our place Picard and Beverly ended up getting married. He is the son of Cherie and was hatched in 1993, while she was born in 1994. They were high school sweethearts and have been together since they were young, but they were infertile and never hatched any of their eggs. Some people in rescue may find it shocking that a breeder could turn into a rescuer. If you watch the documentary "Parrot's Confidential" you will find that several of the parrot rescue organizations featured in the program are run by former breeders. In the 1980's and 1990's when these birds were breeding, there were people on waiting lists for their babies. Most of the birds in pet stores at that time were wild caught, untamed, and were not suitable to be pets. Captive breeding helped supply the demand for pets so that importation of parrots was stopped in 1992. Some species were so decimated in the wild that breeding in captivity is the only way to preserve them. Click HERE to see more of our Sanctuary birds! There aren't a lot of pink parrots out there, but we have Dashee, the Bourke Parakeet, our only pink bird. Bourke Parakeets are an Australian species with a reputation for being sweet, gentle, and quiet. That is exactly what you would expect from a pink bird, right? Dashee got into a fight with another Bourke who used to live here, and suffered multiple bite wounds on his feet. Following those injuries he repeatedly chewed on his toes every time the bandages were removed, and eventually he damaged all of his toes except one. We now keep his feet bandaged and change them every two weeks. He prefers to sit on a platform instead of a round perch. ​Ernie the blue budgie had an injury to his upper beak so it doesn't grow to a normal length, meaning his lower beak overgrows. He needs a beak trim about once a month, so it is hard to find an adoptive home that wants to deal with that amount of work. Most birds can live their entire lives and never need a beak trim. Injuries, disease, or birth defects can result in a beak that doesn't wear properly, so frequent trimmings become necessary. Bindi the albino (pure white) is blind from glaucoma and corneal scars. BooBoo the cinnamon (light grey) is missing half of her left leg, two toes on her right foot, and her left wing below the elbow. Together they should be some kind of superhero alliance! Their cage has paper on top of the wire grate to accommodate BooBoo and her one leg. The rope perches are down by the floor for the easy access of Bindi. They get along very well, especially if we keep everything in the same place so they get used to the lay out. BooBoo came from a breeder who was selling a dozen cockatiels to someone who wanted to start breeding birds. The deal was for 12 cockatiels, so the breeder stuffed 12 birds into a box, not mentioning that BooBoo was missing half of her limbs. We know there are some good breeders out there, but obviously this person was not one of them! Ringo is a Patagonian Conure, the largest member of over 100 species in the conure family. They can be pretty loud, and are not known to be great talkers, but they seem to be real clowns. They are difficult to breed in captivity, and were never common, so there are very few of them around any more. Hatched in 2002, Ringo was adopted from our rescue in 2008 after going thru 2 homes that we know of, but then the third owner decided to get rid of him a few years later. He refused to bring the bird back to us, but gave him to a friend. That friend happened to be one of our favorite clients, and when she had to give him up due to health problems, she brought him back to us. He will live out the rest of his life here in our sanctuary instead of going to yet another home. Pickle is a Brown Throated Conure, a species we see only rarely. They were never a popular bird for breeders because they aren't brightly colored or famous for being great talkers. Pickle got himself in trouble a couple of times by jumping onto the cages of his larger parrot neighbors. They bit his feet, causing some permanent damage. He gets a weekly foot massage with oil to keep his toes limbered up and the skin healthy. He has the attitude of a giant aggressive watch dog, so we have to watch our fingers when it is feeding time. Ariel the Peachface Lovebird, hatched in 2010, was surrendered to the rescue when her owner was no longer able to care for her due to illness. She had been allowed to live with a conure that bit her on the face, causing a deformity of one nostril. She later suffered an infection that caused inner ear damage, and we thought she would not recover. Today she is strong and healthy, and may be allowed to enter the adoption program some day. She is shy, but seems to love other birds, and may be happy to find a home with another bird to be her friend. Cockatiels, especially the females, are generally considered gentle and nonaggressive. Bella is exactly that, plus she is a lovely pearl color mutation, with pretty yellow scallops down the back of her feathers. She was born in 2009, which was verified by her leg band that includes the year of her hatching. Bella has not been put up for adoption because she has a stubborn case of diarrhea. She has had multiple blood and stool tests, but multiple courses of treatment with 4 different antibiotics for her 2 infections, the diarrhea keeps coming back. Very few people would want to clean up after a bird that is this messy. Sponsored by: Anonymous sponsor in memory of their beloved cockatiel, Bartels.